Facial hair it is a funny thing. Some people need to shave twice a day and others barely need to shave and do it purely for the routine. I'm somewhere in between. I don't struggle to grow a moustache for Movember but I don't have a five o'clock shadow by the time I get to work. However I have been participating in the removal of facial hair for over 20 years and for the most part it's something you just do. Over the years I haven't really been that convinced by the razors on the market. I remember the Gillette and their twin blades. Then with some moisturising strip. Wilkinson Sword would have a similar product. Then it became 3 blades! Woo hoo! Of course we want more blades because more blades means better right! Wrong! Most of the time I found that the blades often clogged up rather quickly during one shaving session. And to add to it every time I went to stock up on more blades I'd always be rather surprised by how much it was costing. But why is it costing more and the shaving experience become less satisfactory? I couldn't help but feel rather trapped by my ever regrowing facial hair. It wasn't until I saw on a facebook update mention that someone had recently moved over to double edged safety razors. I had completely forgotten about them and it brought back memories of Dad's double edge razor when I was kid. What have I got to lose, I might as well get myself one and give it ago. Google quickly found a few websites that seemed to stock a good selection. http://www.shaving-shack.com/ and http://www.traditionalshaving.co.uk/en/ I spent more time looking and comparing and I eventually shopped with Traditional Shaving. 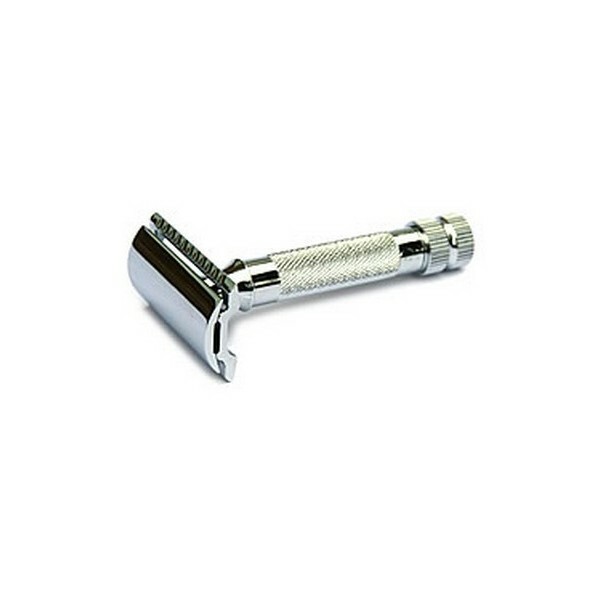 I bought a Merkur 34C HD pictured below. It's quite a short shaft but had good weight to it which seems to steady the stroke when in use. The set I bought also came with Truefitt and Hill 1805 Shave Cream and an Edwin Jagger Badger Shaving Brush. Of course I need some razor blades to go with it all and decided to try some Astra Superior Platinum Razor Blades. Of course there is the cost aspect. It is up to you how much you want to invest, and I do mean invest as you will be shaving for the rest of your life (unless you decide to not and just grow a beard and not trim the edges at all). The brush will last you a while if you choose a reasonable one and take care of it. The shaving cream I can see will last a while too given my frequency of shaving and how much I lather I seem to get out of it. The blades vary from 15p to 25p or more depending on what razors you prefer using. Cost wise it feels like it's cheaper in the medium/long term but the shaving experience is much better. It's what grown up shaving is about! I can't see myself going back using the over priced Gillette cartridges. I wish I had tried doubled edged razors much earlier on in life but then again, maybe it is after the years of disappointment that's made me appreciate double edge razors much more. Maybe I should try straight/cut-throat razors next? Anyway I recommend giving double edge razors a go. If you're looking for a good gift for a man, a shaving set is definitely a sophisticated solution for your gift dilemma.